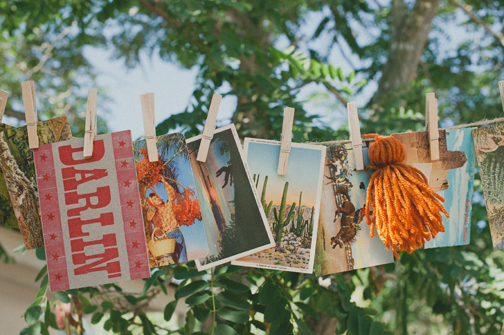 6 ways to celebrate a Southwestern-style vintage wedding by repurposing flea market finds. 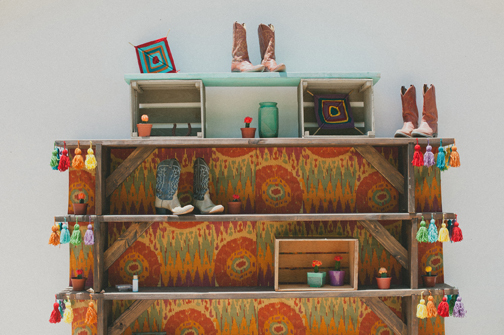 2) Melissa constructed her favorite piece—these colorful shelves—by stacking vintage benches (above). The vibrant ikat fabric backdrop echoes the table runner and provides the color scheme for the tassels that hang at the benches’ edges. By stacking wooden boxes on the top shelf, Melissa expanded the space; filling in the boxes with knitting, potted flowers, vintage glassware and cowboy boots creates visual interest and depth while keeping the vignette from becoming too symmetrical. 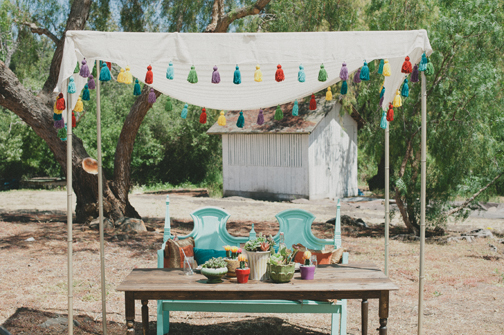 4) For a character-filled table setting, the wedding coordinator displayed the mismatched vintage cutlery Melissa has accumulated over the years alongside rusted flowerpots (above). “Finding the fabric for the runnerwas a jumping off point for Melissa and me,” bride Leigh Ann Conate says. 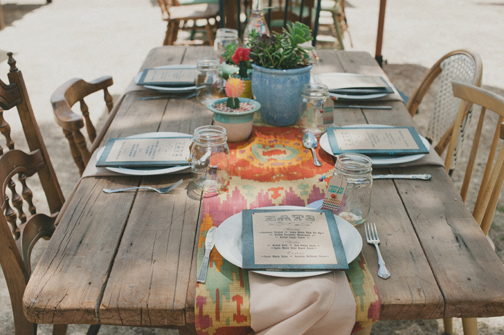 “While it’s an ikat fabric with a tribal look, it provided our Southwestern colors: turquoise, coral, mustard and purple.” The mother of the bride joined in on the DIY process by sewing the Cost Plus curtain fabric into the pattern Leigh Ann and Melissa designed. 6) Melissa stacked whiskey barrels and old scaffolding to create a cheery art installation that functioned as a bar (above). 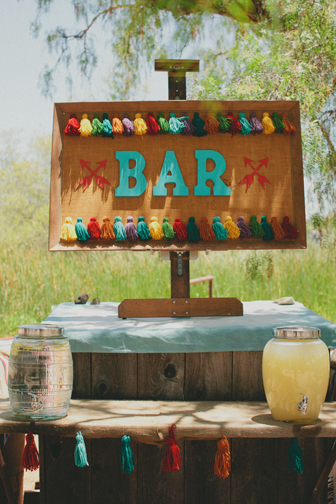 This entry was posted in Repurpose It and tagged cowgirl wedding, repurpose vintage finds, repurposed decor, repurposed home decor, repurposed wedding, repurposing, Southwestern wedding, summer wedding, vintage wedding, vintage wedding decor by Flea Market Decor. Bookmark the permalink.